Some people like it, some don't, the starting points for what's quality and appealing adaptations is personal and perfectly fine to be presented, and presented here if connected to the mod. However If I see any flaming taking place, or debates of no consequence for the mod, I will use my moderation mace and go Sauron-movie-version on the posts. In the case with DCI: LA we will maintain aestethics presented by the movie as said, while our foundation for game content is based on JRR Tolkien to the extent he allow us to, and as a rule our own 1st hand creative conclusions when he leave us holes to fill. Last edited by Ngugi; January 19, 2013 at 09:09 AM. You'll turn into a giant flaming eye? I'm probably tempting fate now, but..Oh well. Last edited by Feanaro Curufinwe; January 19, 2013 at 09:25 AM. In a way Sanderman is right, PJ could concievably have done less presentation of background story, so we should be grateful for what is there. Notice that despite my hatred of PJ, I think it fine he included as much. It is just so... well, the least impolite way I can describe it is that it is utter bullpoop, there is nothing right about it from a Lore PoV, except that it tells that the LA was formed, a war was fought and Sauron lost the One. Under the cold stars before the rising of the Moon the host of Feanor went up the long Firth of Dengrist that pierced the Echoing Hills of Ered Lomin, and passed thus from the shores into the great land of Hithlum; and they came at length to the long lake of Mithrim, and upon its northern shore made their encampment in the region that bore the same name. But the host of Morgoth, aroused by the tumult of Lammoth and the light of the burning at Losgar, came through the passes of Ered Wethrin, the Mountains of Shadow, and assailed Feanor on a sudden, before his camp was full-wrought or put in defence; and there on the grey fields of Mithrim was fought the Second Battle in the Wars of Beleriand. Dagor-nuin-Giliath it is named, the Battle-under-Stars, for the Moon had not yet risen; and it is renowned in song. The Noldor, outnumbered and taken at unawares, were yet swiftly victorious; for the light of Aman was not yet dimmed in their eyes, and they were strong and swift, and deadly in anger, and their swords were long and terrible. The Orcs fled before them, and they were driven forth from Mithrim with great slaughter, and hunted over the Mountains of Shadow into the great plain of Ard-galen, that lay northward of Dorthonion. There the armies of Morgoth that had passed south into the Vale of Sirion and beleaguered Cirdan in the Havens in the Havens of the Falas came up to aid them, and were caught in their ruin. For Celegorm, Feanor's son, having news of them, waylaid them with a part of the Elven-host, and coming down upon them out of the hills near Eithel Sirion drove them into the Fen of Serech. Evil indeed were the tidings that came at last to Angband, and Morgoth was dismayed. Ten days that battle lasted, and from it returned of all the hosts that he had prepared for the conquest of Beleriand no more than a handful of leaves. Yet cause he had for great joy, though it was hidden from him for a while. For Feanor, in his wrath against the Enemy, would not halt, but pressed on behind the remnant of the Orcs, thinking so to come at Morgoth himself; and he laughed aloud as he wielded his sword, rejoicing that he had dared the wrath of the Valar and the evils of the road, that he might see the hour of his vengeance. Nothing did he know of Angband or the great strength of defence that Morgoth turned so swiftly prepared; but even had he known it would not have deterred him, for he was fey, consumed by the flame of his own wrath. Thus it was that he drew far ahead of the van of his host; and seeing this the servants of Morgoth turned to bay, and there issued from Angband Balrogs to aid them. There upon the confines of Dor Daedeloth, the land of Morgoth, Feanor was surrounded, with few friends about him. Long he fought on, undismayed, though he was wrapped in fire and wounded with many wounds; but at last he was smitten to the ground by Gothmog, Lord of Balrogs, whom Ecthelion after slew in Gondolin. There he would have perished, had not his sons in that moment come up with force to his aid; and the Balrogs left him, and departed to Angband. Then his sons raised up their father and bore him back towards Mithrim. But as they drew near to Eithel Sirion and were upon the upward pass over the mountains, Feanor bade them halt; for his wounds were mortal, and he knew that his hour was come. And looking out from the slopes of Ered Wethrin with his last sight he beheld far off the peeks of Thangorodrim, mightiest of the towers of Middle-earth, and knew with the foreknowledge of death that no power of the Noldor would ever overthrow them; but he cursed the name of Morgoth thrice, and laid it upon his sons to hold their oath, and to avenge their father. Then he died; but he had neither burial nor tomb, for so fiery was his spirit that as it sped his body fell to ash, and was borne away like smoke; and his likeness has never again appeared in Arda, neither has his spirit left the halls of Mandos. Thus ended the mightiest of the Noldor, of whose deeds came both their greatest renown and their most grievous woe. Now news came to Hithlum that Dorthonion was lost and the sons of Finarfin overthrown, and that the sons of Fëanor were driven from their lands. Then Fingolfin beheld (as it seemed to him) the utter ruin of the Noldor, and the defeat beyond redress of all their houses; and filled with wrath and despair he mounted Rochallor his great horse and rode forth alone, and none might restrain him. He passed over Dor-nu-Fauglith like a wind amid the dust, and all that beheld his onset fled in amaze, thinking that Oromë himself was come: for a great madness of rage was upon him, so that his eyes shone like the eyes of the Valar. Thus he came alone to Angband's gates, and challenged Morgoth to come forth to single combat. And Morgoth came. That was the last time in those wars that he passed the doors of his stronghold, and it is said that he took the challenge willingly; for though his might was greatest of all things in the world, alone of the Valar he knew fear. But he could not deny the challenge before the face of his captains; for the rocks rang with the shrill music of Fingolfin's horn, and his voice came keen and clear down into the depths of Angband; and Fingolfin named Morgoth craven, and lord of slaves. Therefore Morgoth came, climbing slowly from his subterranean throne, and the rumour of his feet was like thunder underground. And he issued forth clad in black armour; and he stood before the King like a tower, iron-crowned, and his vast shield, sable unblazoned, cast a shadow over him like a stormcloud. But Fingolfin gleamed beneath it as a star; for his mail was overlaid with silver, and his blue shield was set with crystals; and he drew his sword Ringil, that glittered like ice. Then Morgoth hurled aloft Grond, the Hammer of the Underworld, and swung it down like a bolt of thunder. But Fingolfin sprang aside, and Grond rent a mighty pit in the earth, whence smoke and fire darted. Many times Morgoth essayed to smite him, and each time Fingolfin leaped away, as a lightening shoots from under a dark cloud; and he wounded Morgoth with seven wounds, and seven times Morgoth gave a cry of anguish, whereat the hosts of Angband fell upon their faces in dismay, and the cries echoed in the Northlands. But at the last the King grew weary, and Morgoth bore down his shield upon him. Thrice he was crushed to his knees, and thrice arose again and bore up his broken shield and stricken helm. But the earth was all rent and pitted about him, and he stumbled and fell backward before the feet of Morgoth; and Morgoth set his left foot upon his neck, and the weight of it was like a fallen hill. Yet with his last and desperate stroke Fingolfin hewed the foot with Ringil, and the blood gushed forth black and smoking and filled the pits of Grond. Thus died Fingolfin, High King of the Noldor, most proud and valiant of the Elven-kings of old. The Orcs made no boast of that duel at the gate; neither do the Elves sing of it, for their sorrow is too deep. Yet the tale of it is remembered still, for Thorondor King of Eagles brought the tidings to Gondolin, and to Hithlum afar off. And Morgoth took the body of the Elven-king and broke it, and would cast it to his wolves; but Thorondor came hasting from his eyrie amoung the peaks of Crissaegrim, and he stooped upon Morgoth and marred his face. The rushing of the wings of Thorondor was lie the noise of the winds of Manwë, and he seized the body in his mighty talons, and soaring suddenly above the darts of the Orcs he bore the King away. And he laid him upon a mountain-top that looked from the north upon the hidden valley of Gondolin; and Turgon coming built a high cairn over his father. No Orc dared ever after to pass over the mount of Fingolfin or draw nigh his tomb, until the doom of Gondolin was come and treachery was born among his kin. Morgoth went ever halt of one foot after that day, and the pain of his wounds could not be healed; and in his face was the scar that Thorondor made. Great was the lamentation in Hithlum when the fall of Fingolfin became known, and Fingon in sorrow took the lordship of the house of Fingolfin and the kingdom of the Noldor; but his young son Ereinion (who was after named Gil-galad) he sent to the Havens. Now fighting several Balrogs or Morgoth himself is not that "gay" is it? I've not read the Silmarillion, but i've read ALOT about the first age and it's events..
And i didn't mean the things the elves do is ghey-ish... But the way they look... Long, straight hair doesn't fit men. But the armour they wear make them look like badasses. They're not Men, they're Elves. It's nothing more strange than the fashion with beards, which is 'out' now but during as late as 1960ths and 1970ths was very 'in', or 'gender colour' where during the 18th century pink was a boy colour and blue was a girl colour but it was change since blue was considered to bring more luck, haha. If you want, I can find you hundreds of pictures of Viking fighting re-enactors with long hair that are very masculine indeed- some are veterans of some pretty nasty wars from Falklands and onwards. I think he means the straight hair though. Which strikes me as strange as that is not how I envision Elves, but that is but one of my gripes with them in PJ's interpretation. Just as I very much dislike the way the Rohir and Gondorians are portrayed. As interesting as this is we do seem to be trecking into off topicness again. 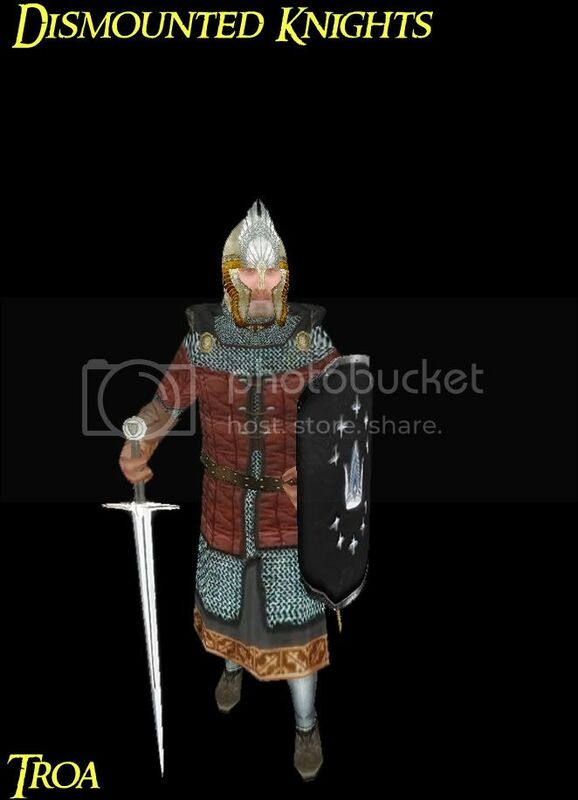 On a side note hopefully we'll have the numenorean preview up in the next week. There might be something here of use. McBride was a brilliant artist. I like this project very much indeed! I don't think straight hair is a problem, but it's not for everyone. 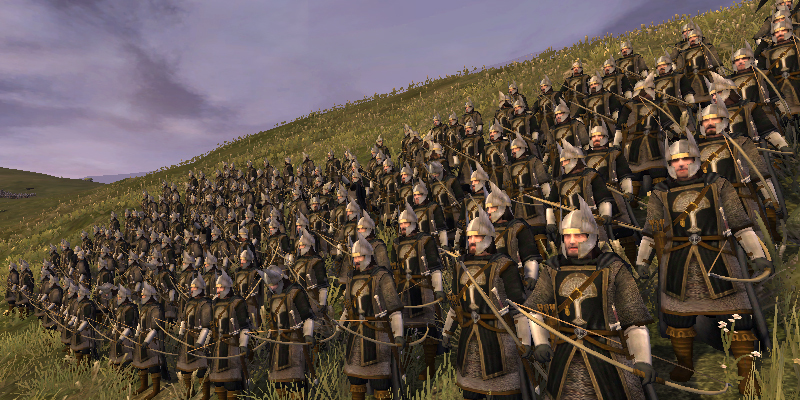 The natives of Ennor, Middle-earth, make up the majority of the population of the Kingdoms in Exile, weither they are kindred to the three Houses of the Edain or others; and as levies they repay their new lords for the prosperity and peace brought to the land, as the bulk of the armies. 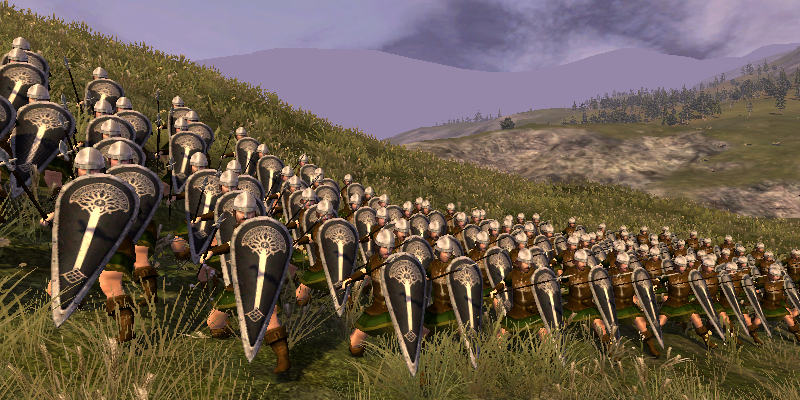 With their shields and spears they can form a battle line, but should not be trusted to hold it on their own against heavy enemy troops. 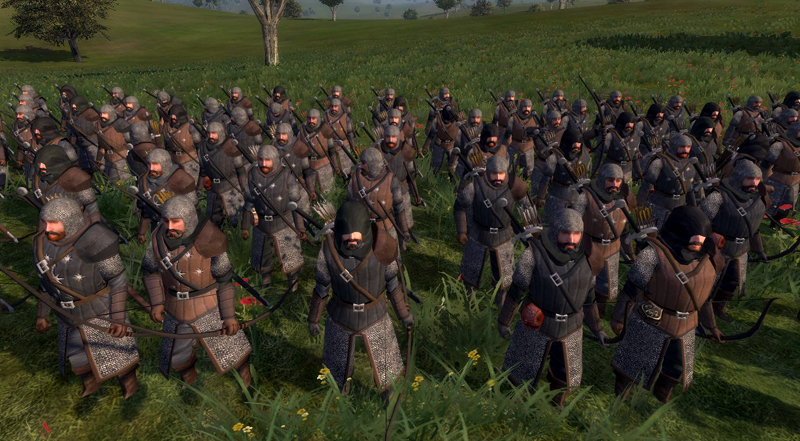 By tradition skilled as hunters the peoples of Middle-earth, who have had the fortune to get benevolent Dúnedain lords and gained enlightment and prosperity, can now support their leaders and protect their homes as marksmen. Their outfit is of better quality than their counter-parts who do not live within the Kingdoms in Exile, but they should keep a healty distance from the enemy assults. 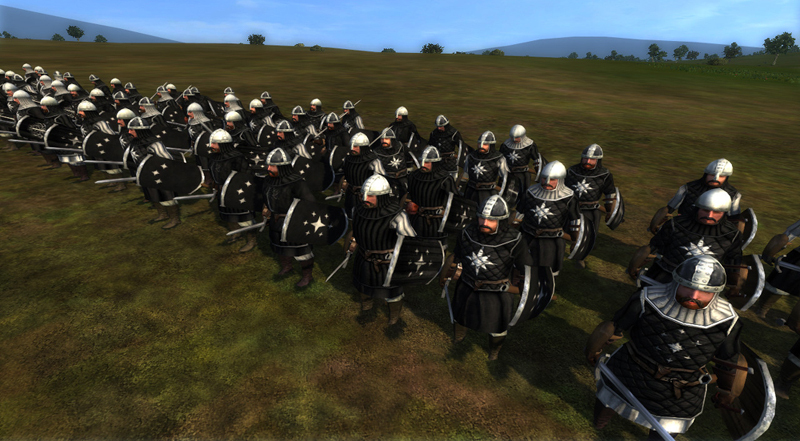 The King's Rouqen are military veterans who band up and by choise take an oath to serve the king. Their mustering house is located wherever the court is to be found, and the men are ever eager and potent to step up. Their homeland has been lost to the Sea trough the corruption of Sauron, and that must be avenged. 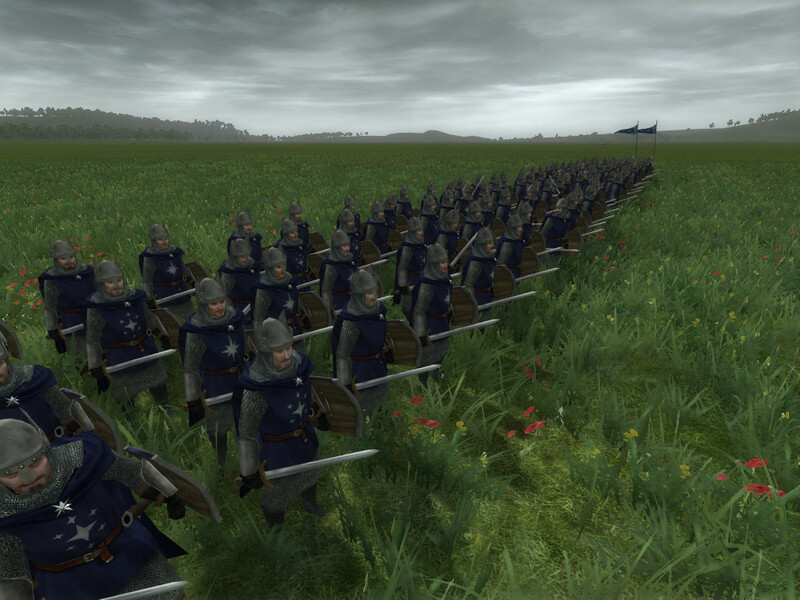 Heavy Infantry only avilable trough the Capital Building [a DCI: LA uniqe feature], wherever the capital may be moved, thus the unit is avilable from campaign start. 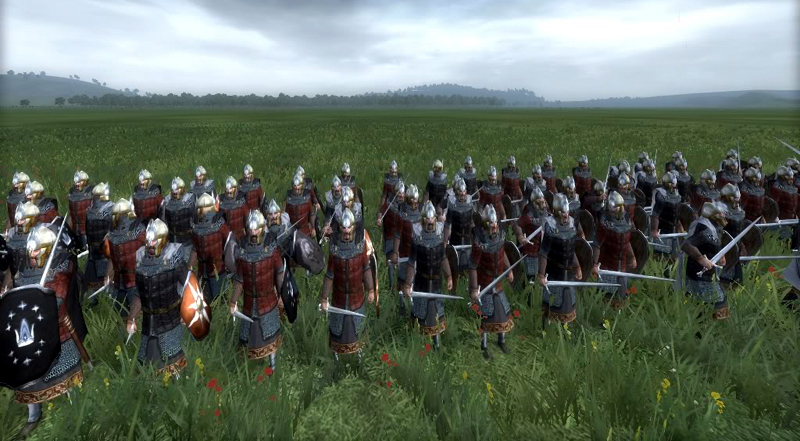 Men of partly Númenórean heritage or young Númenóreans form up the Othar companies. 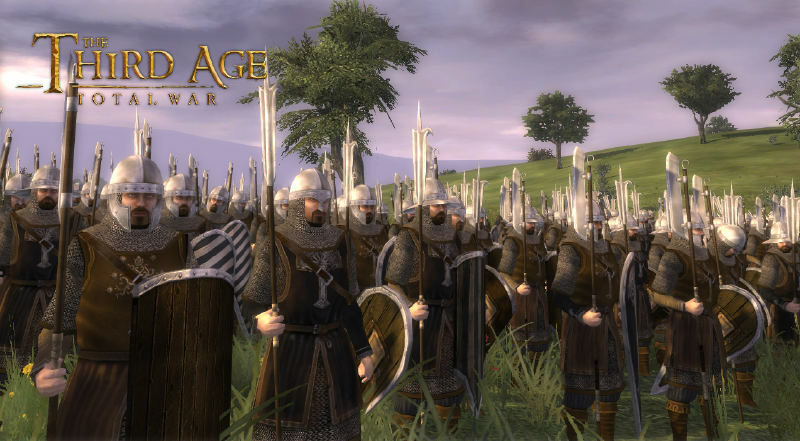 While lesser than their lords and elders in the gifts of Númenor and experience in warfare they still show high skill, courage and bring quality gear of war into the fray. The spear may be the oldest weapon of them all, but with a good reach and well forged tip is no less potent for that. 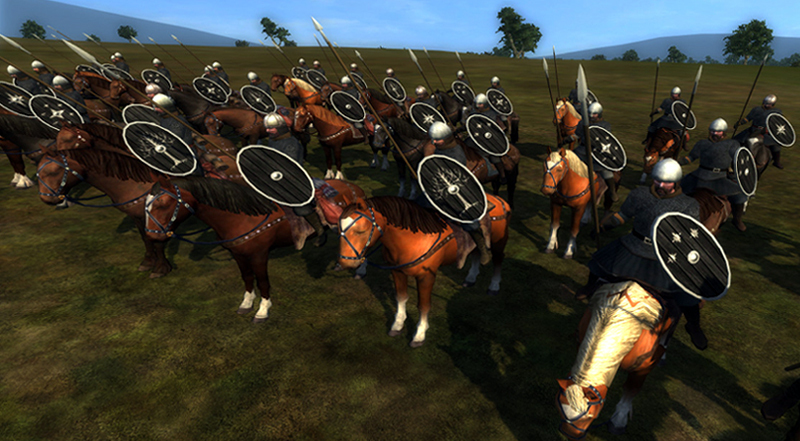 The mightiest riders fear them and no Captain of the army would do without them. Othar companies are raised from the partly Dúnedain population and the young Dúnedain of the Realms. Even if they do not match the strength of the knights, their quality education and arms mean that they can take on any threat that challenge their kingdom. 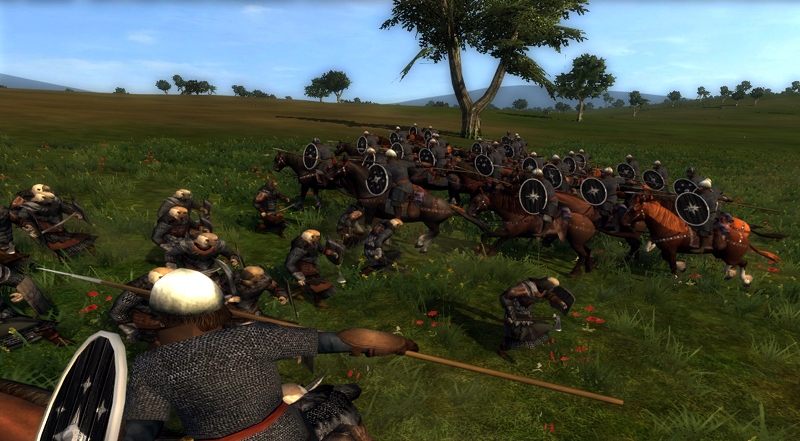 Best deployed they take on hostile infantry, to breach it or so that the cavalry or other forces can flank and act as the hammer to an anvil. Elendil promised that the land would be theirs till the end of time, and under the banner of the Seven stars the Othar will see it trough. The Númenóreans do not themselves ride horses into battle, they are frankly to big for the mounts of Middle-earth, but entrust this to their subjects and mercinaries from other folks. 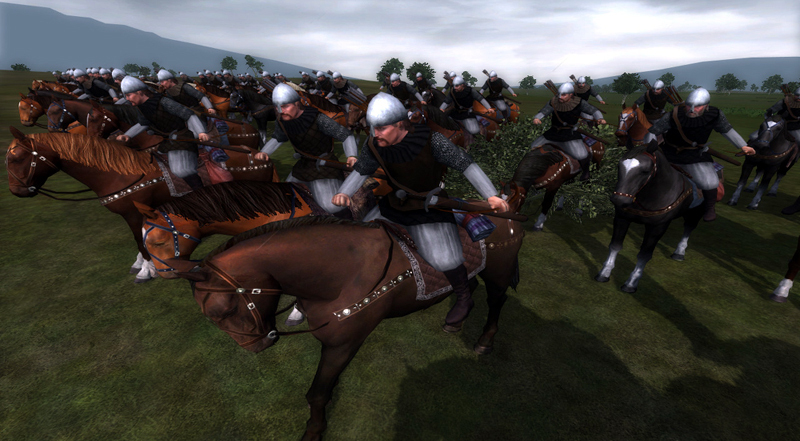 The Rochben combines the tough stock of native Men and horses with the outfit of a Númenórean army. On Númenor the art of horse archery was much practised, but as the island sank most of that great race of horses were lost. 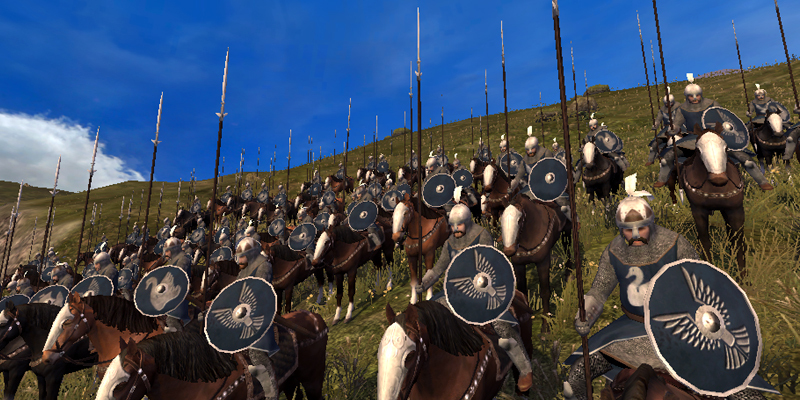 In exile in Middle-earth the Númenóreans have had to few to make up any standing cavalry of their own, but rely on their subjects or mercenaries from the native folks who properly can mount the smaller horsebreeds of the land. 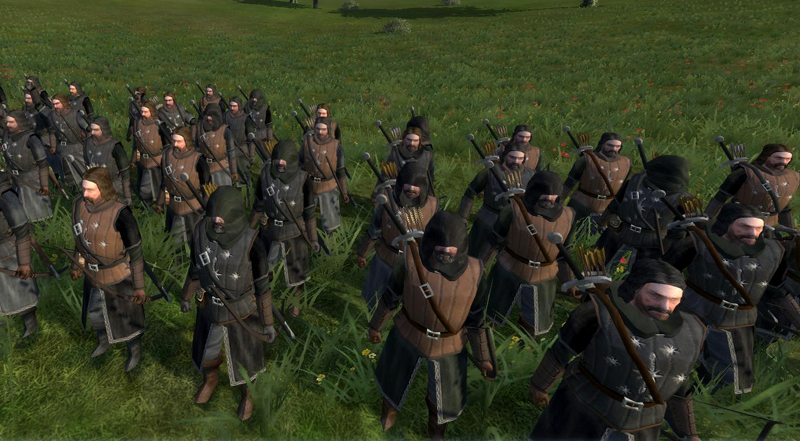 The Rochben Archers combines mobile marksmen with the outfit of a Númenórean army. The Númenórean inhabitants of Arthedain honour the old art of throwing spears as well as form a line of it, to daunt beast and foe alike. 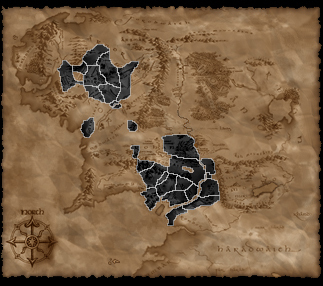 Arthedain is the fertile west part of Arnor and is the home of the greatest population of Dúnedain, and loyal Middle-men, in the North Kingdom. There lies Elendil's city, the capital Annuminas, by the lake Evendim where once Celeborn and Galadriel walked the land and the bonds to Gil-galad in Lindon are firm. 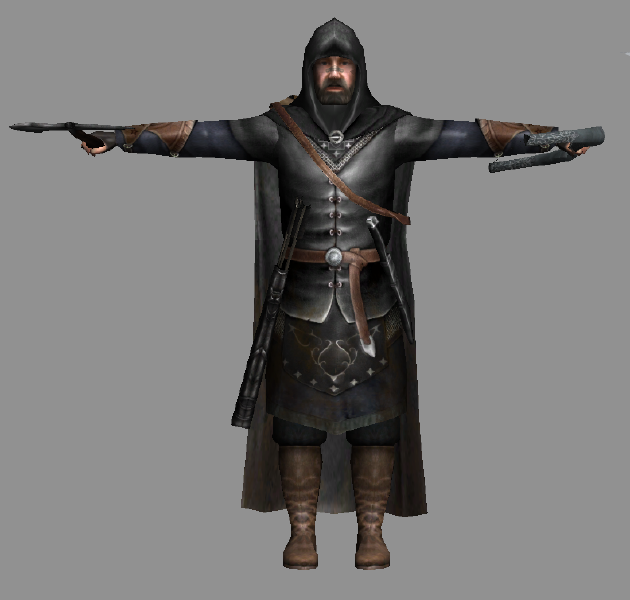 Therefor it is not surprising that the settlers of Arthedain, when they are summoned to defend the West against Sauron and other foes, do not hesitate to grab their arms and march out. Once upon a time, in the days of bliss, swords were at best herilooms to hang on the wall in the grand mansions of the sunken homeland. But that was long ago, the Númenórean settlers of Cardolan in Arnor honour now the skill with the sword, in these dark times most required. The realm of Cardolan is in the south and east of the kingdom, where it borders the Grey River, the Old Forest and the Weather Hills. It is a prosperous area trough which the Great East Road run and where ancient burial mounds can be found, and its settlers are proud to have tamed and brought enlightment to the land, and will not suffer any enemy to bring that to an end. The Elf-friends of Númenor settled long ago along the river Anduin to seek fortune and avoid oppression from the King's Men, and came to mingle with their native subjects of the land. Those subjects are kin to the Men of the Mountain and Wildmen of Enedwaith, who all are related to the People of Haleth, even if the Dúnedain themselves are not aware of that, who in Beleriand in the First Age became the ancestors of the Númenóreans. 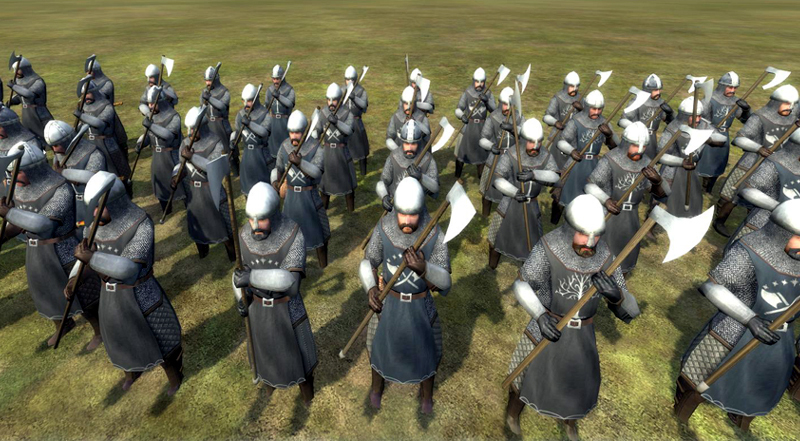 The Lossarnach inhabitants share heritage from both the Dúnedain and the native Men of Gondor and by tradition from both linages they are skilled with the axe. 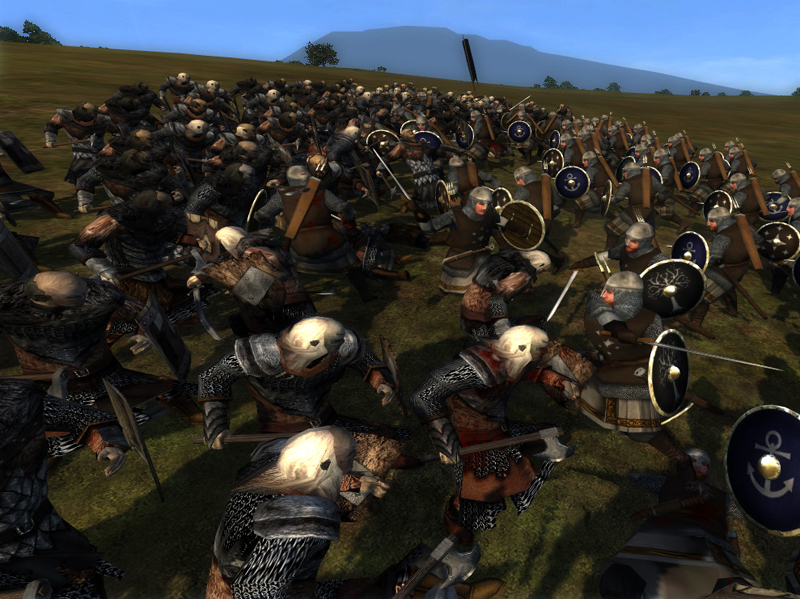 Axemen summoned by the Lord of Lossarnach are reknown for their use of a mighty two-handed variant and with it they ache to charge, to face the enemies of the West. 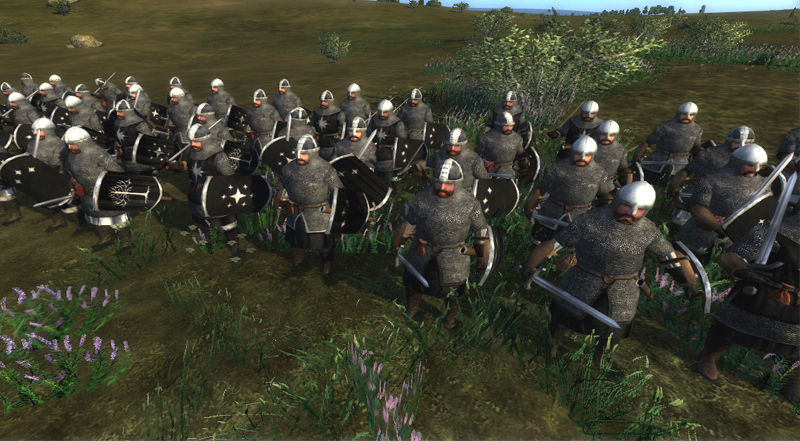 The Lossarnach inhabitants have inherited gifts from the Kings of Men and inherited the knowledge of the land from the Men of the White Mountain, making them formidable soldiers in the service of the realm. 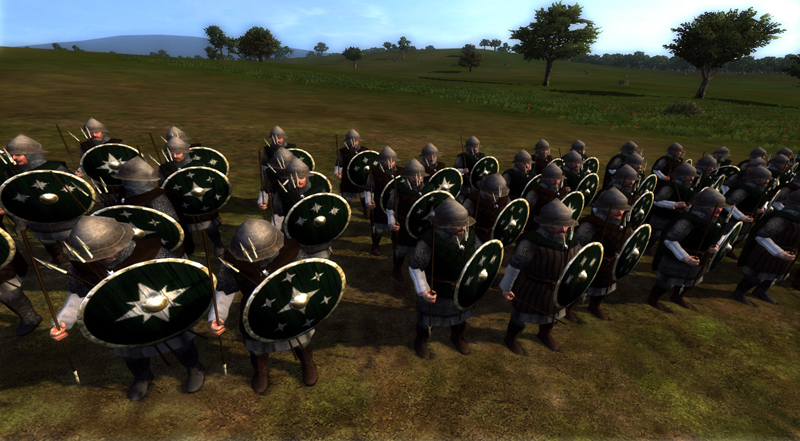 Their double heritage give them double reasons to defend Gondor and to face the enemies of the Númenóreans. Hunters of the wild mountain regions and vales their aim is true, and they have been outfitted to make fullest use of their capacity. 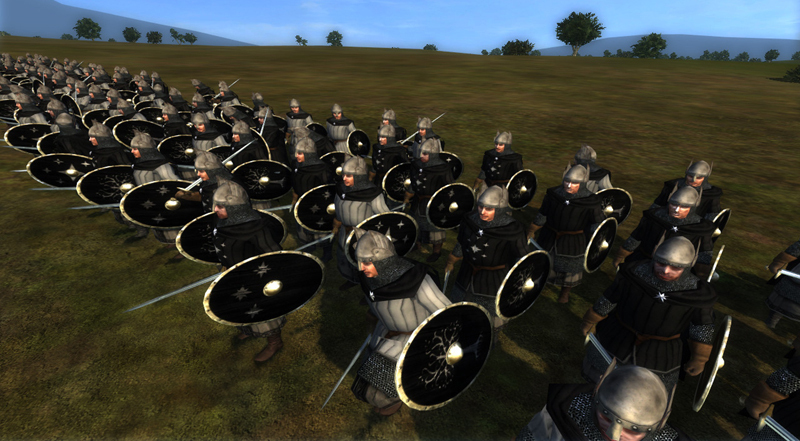 Seasoned men from among the Kings of Men, the Dúnedain, lords and elite of the Kingdoms in Exile, form these heavy infantry regiments of knights. Most are born in Middle-earth but still not few of them was born in Númenor and settled in Gondor and Arnor as a result of the Elf-friends migration, or came with Elendil and his sons on the nine ships that escaped the destruction of their homeland. No other people have been granted greater gifts in body and knowledge, and these remnants who stayed true to Eru Ilúvatar and the Valar despair over the fall from grace that occured. Now once more Sauron, who brought about the final corruption of their people as he manipulated Ar-Pharazon and the King's Men to attack Valinor, have decalared war upon them, and it has become time to turn grief into just action. Ever ready to bring destruction upon the enemies of Arnor and Gondor, above them shine stars of hope and under them tremble the Earth that Elendil promised them, when they march for Barad-dûr. For centuries the Men of Middle-earth have feared the approach of ships at their shores, as an omen of a great rain of black death. 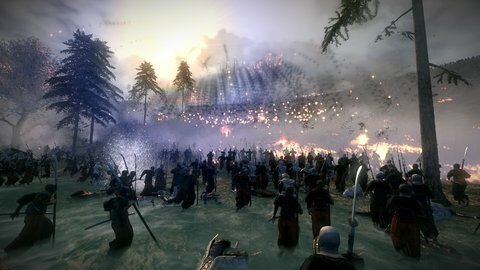 The Númenóreans have created hollow steel bows, very powerful and far reaching, a great piece of craftsmanship that now will make its name on the continent as a tool of the Elf-friends to defy tyranny and not to aid it, as it has been and is under the oppression of the King's Men and Black Númenóreans. 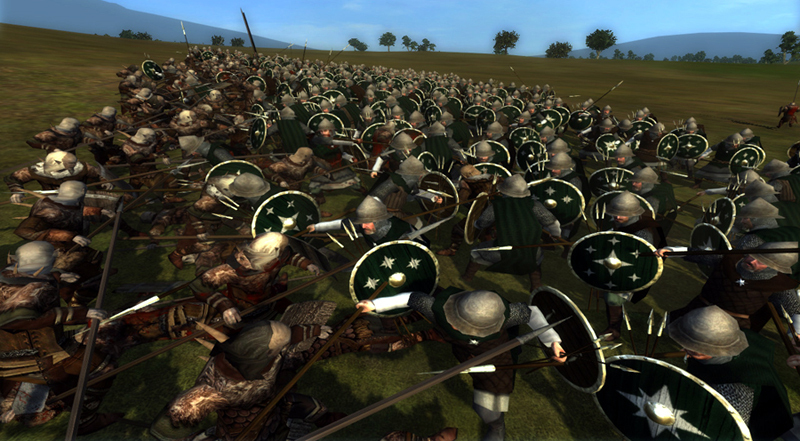 In the skilled hands of Númenórean soldiers the steel bow may tip the balance in the struggle for the survival of the Kingdoms. For counless years the mariners of Númenór sailed the world, as explorers, to aid or to raid, as colonizers or tradesmen, always ready to fend themselves from threats, or to pose one when needed. Still after their ancestral home is lost these mighty men, of both pure and mixed blood, patrol the coasts from pirates or Black Númenóreans, or disembark to pentrate their enemies with a thrown spear and sharp sword. The rural eastern regions of Arnor by the foot of the Misty Mountain often face unwelcomed guests in the form of wolves, Orcs and trolls. Only the sternest and hardiest of the settlers from Númenór have made this beautiful but dangerous land their home, and thus its dangers they have learned how to face. Armed with strong bows and deadly two-handed axes the Troll Hunters go for even the worst of foes, their mighty ancestry more than honoured. 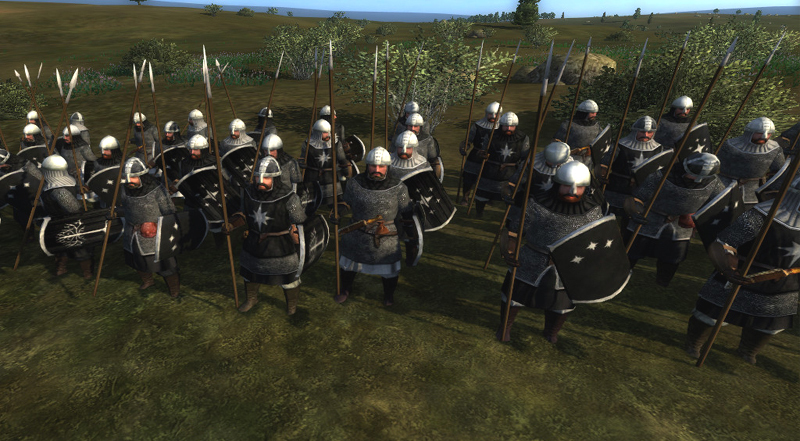 The men of Belfalas come clad to battle in the colours and emblems of their prince. Decendants of Númenor they have maintained much of the gifts of Eru Illúvatar also under the Sun of Middle-earth. 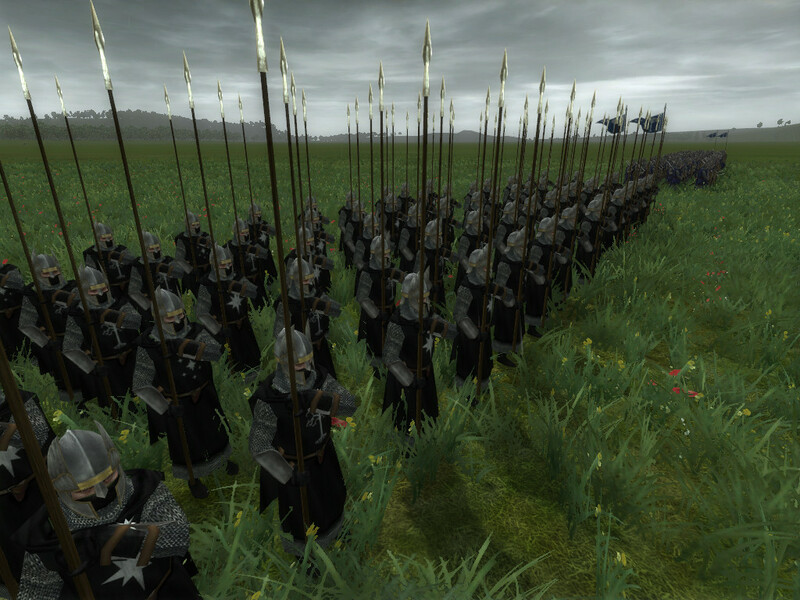 Gondor is their home and they gladly follow their kings into battle to protect it from anyone wicked and illfated enough to try to threaten it. Any man in Gondor would consider it an honour to be elcted to join the wardens of the Dome of Stars in Osgiliath. 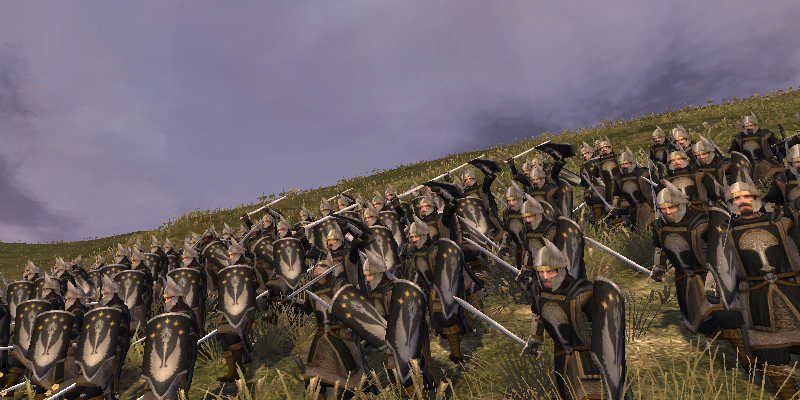 Their order has been inspired by the phalanxes of the Lindon Elves in a tradition that goes back to the migthy city of Gondolin, the longspears reach are impressive and their edges sharp. The Wardens march wherever duty will take them, to make sure that any threat to their beloved city will pay the consequences for such folly and evil. In the men of Belfalas the gifts of the Dúnedain race run strong. There are among them skilled riders, since on the field of Belfalas most of the few horses that stem from Númenor are held. 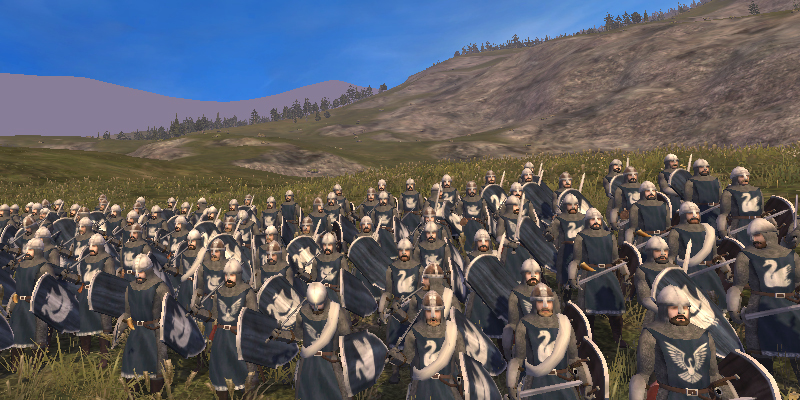 Those who sit up upon them raise the Swan banner of the prince of Belfalas, a title given by Elendil himself, commonly thus called 'the Swan Knights'; to thunder of hooves they bring death to the foes of the land. 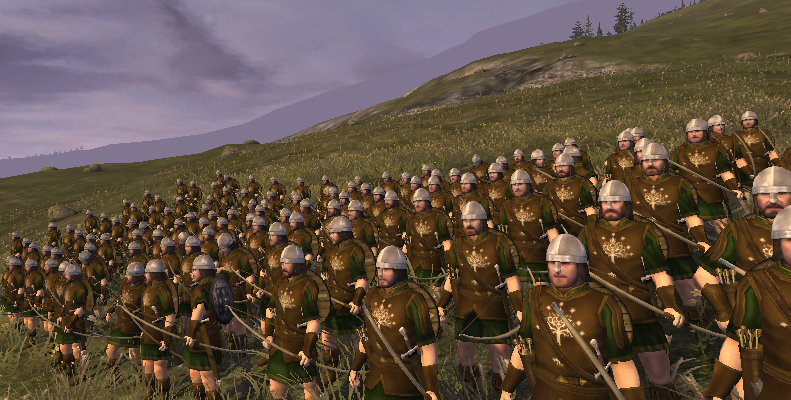 Even when not mustered into service these common, but true hearted, men of the Realms in Exiles volunteer to the cause of their kings, to march out in defence the West. 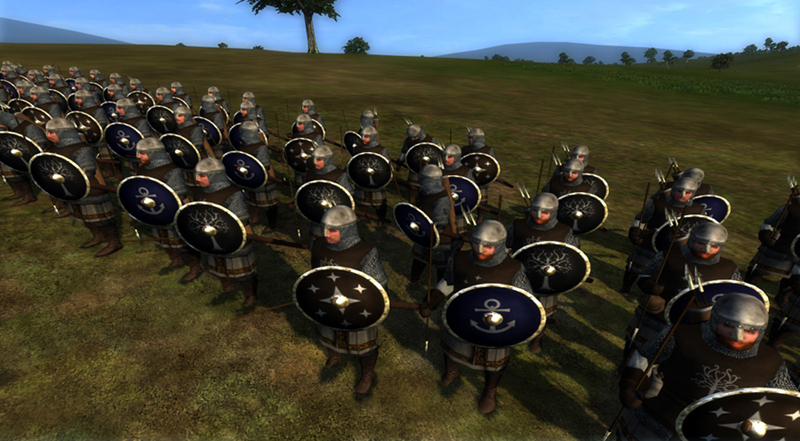 Even when not called into service these valiant lords rally to the cause of their kings, to defend the West. Extra credit from Curufin to Taro_M for Bag o' tricks that was useful for the some base textures. Mounts belongs to vanilla TATW. Last edited by Ngugi; July 23, 2015 at 04:42 PM. Good job with the preview team !